In this related blog post, you can find links to the CONSORT statement in the Dec 26, 2012 issue of JAMA and a link to my letter to the editor. Addendum: I should have included this in the video. See the picture below. 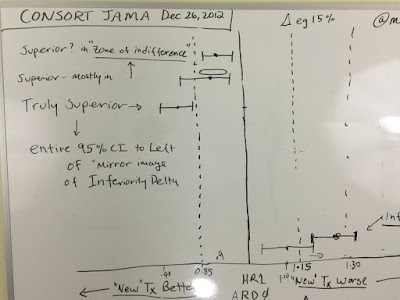 In the first example, top left, the entire 95% CI favoring "new" therapy lies in the "zone of indifference", that is, the pre-specified margin of superiority, a mirror image of the "pre-specified margin of noninferiority, in this case delta= +/- 0.15. Next down, the majority of the 95% CI of the point estimate favoring "new" therapy lies in the "margin of superiority" - so even though the lower end of the 95% CI crosses "mirror delta", the best guess is that the effect of therapy falls in the zone of indifference. 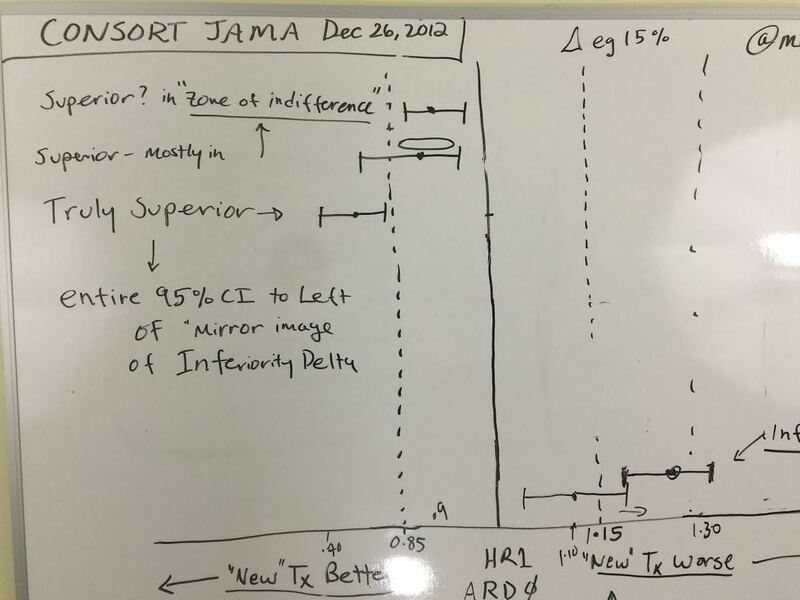 In the lowest example, labeled "Truly Superior", the entire 95% confidence interval falls to the left of "mirror delta" thus reasonable excluding all point estimates in the "zone of indifference" (i.e. +/- delta) and all point estimates favoring the "old" therapy. This would, in my mind, represent "true superiority" in a logical, rational, and symmetrical way that would be very difficult to mount arguments against. Added 9/20/16: For those who question my assertion that the designation of "New" versus "Old" or "comparator" therapy is arbitrary, here is the proof: In this trial, the "New" therapy is DMARDs and the comparator is anti-tumour necrosis factor agents for the treatment of rheumatoid arthritis. The rationale for this trial is that the chronologically newer anti-TNF agents are very costly, and the authors wanted to see if similar improvements in quality of life could be obtained with chronologically older DMARDs. So what is "new" is certainly in the eye of the beholder. Imagine colistin 50 years ago, being tested against, say, a newer spectrum penicillin. The penicillin would have been found to be non-inferior, but with a superior side effect profile. Fast forward 50 years and now colistin could be the "new" resurrected agent and be tested against what 10 years ago was the standard penicillin but is now "old" because of development of resistance. Clearly, "new" and "old" are arbitrary and flexible designations.